Have you ever participated in a readathon? I hadn’t before. Though I have devoted whole days to reading before (many times! ), I didn’t understand how awesome or intense a 24-hour readathon would be. If you are interested in participating, this is the one I did, and the next one is scheduled for October 20, 2018. 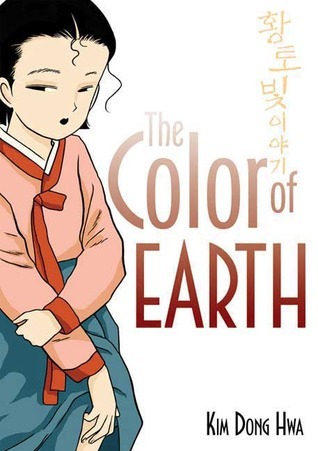 So, how does this relate to Kim Dong Hwa’s graphic novel The Color of Earth? I read it during the April readathon, of course! First love is never easy. Ehwa grows up helping her widowed mother run the local tavern, watching as their customers - both neighbors and strangers - look down on her mother for her single lifestyle. Their social status isolates Ehwa and her mother from the rest of the people in their quiet country village. But as she gets older and sees her mother fall in love again, Ehwa slowly begins to open up to the possibility of love in her life. In the tradition of My Antonia and A Tree Grows in Brooklyn, from the pen of the renowned Korean manwha creator Kim Dong Hwa, comes a trilogy about a girl coming of age, set in the vibrant, beautiful landscape of pastoral Korea. Ehwa is the daughter of a widowed tavern-keeper in rural Korea, and though life is at times lonely due to her mother’s social status, it is also filled with unexpected beauty. As Ehwa grows up, her understanding of the world grows as well, and she relies on her mother for guidance and wisdom. But as her mother is letting romantic love back in, Ehwa discovers first attraction as well – one that may be complicated. In this first of three connected volumes, the author writes and illustrates vignettes adapted from his mother’s life as a young girl growing up in pastoral Korea from many years past. The book is focused on Ehwa’s coming of age, and her rich inner life is the heart of the story (instead of dialogue, which most graphic novels rely on heavily). There is much to love here: excellent art (black and white line work in an anime style with exquisite details in some panels), a strong mother-daughter relationship that features advice-giving, secret-telling, and teaching, an introduction to Korean culture through the meanings of flowers, among other things. The story is also, if you read it closely, told through a male lens. The book’s blurb compares it to coming-of-age classics A Tree Grows in Brooklyn and My Ántonia. While it does share many similarities with those books, including a portrayal of Ehwa’s budding sexuality over time, it does not have some of the… how shall I say this… gentleness? or understanding? maybe the word I’m looking for is empathy? for a young girl growing up in a world designed for men. I can’t describe it any better than that, but you’ll (probably) understand what I mean. So, who is this book for? I think it’s for fans of traditional manga or anime – folks who’ve read graphic novels before. But it is also a beautiful introduction into Korean dress, culture, art styles, and so on – and it could be used in education units. It would also be a good pick for those who like graphic novels but don’t usually read historical fiction. In all, The Color of Earth is a quiet read with strong emotional underpinnings and gorgeous art. I’d pair it with The Undertaking of Lily Chen. Recommended for: graphic novel fans ages 14 and up, and those who appreciate coming-of-age and historical fiction.